Total Score: 8.33 + BEST VALUE AWARD! 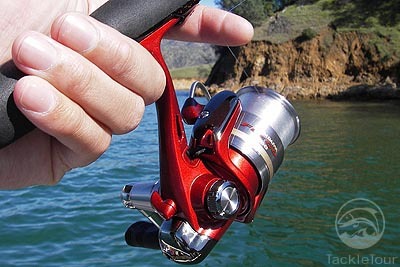 Introduction: Long after the introduction of the Fuego spinning series Daiwa introduces the new smaller size Fuego 2000. This reel brings the benefits of magnesium frame design to anglers looking for a light/ultralight reel. We pair the Fuego 2000 with the Steez spinning rod and see just how well this reel can handle some hard hitting smallmouth. Impressions: Fuego means �fire� in Spanish and carries Daiwa�s tradition of naming their brightly colored reels Spanish themes. 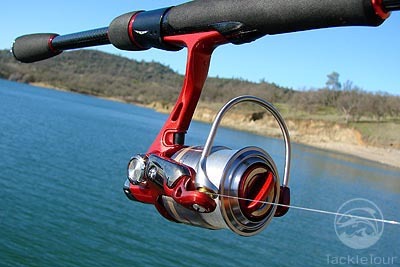 The reel is appropriately named as the reel shares the same deep red finish as it�s popular baitcast sibling. Unlike many competing magnesium based reels the Fuego features both a magnesium frame and sideplate, whereas many competitors only use a magnesium frame and graphite sideplate. 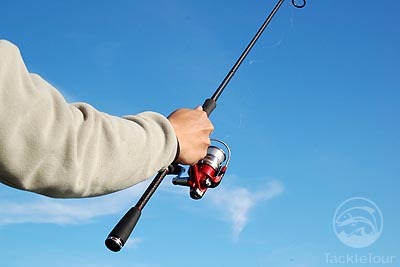 Prior to this point the Fuego spinning reel really targeted anglers that pursued mid to large size species like bass and large trout, as the reel was only offered in larger sizes. This always seemed somewhat odd to me as many anglers that fish for smaller fish like stream based trout and panfish could really benefit from a magnesium based Daiwa reel at this price point. Then just earlier this season the Fuego 2000 was announced. Though it is labeled a 2000 size the Fuego is nearly identical in overall size to the Tierra 1500 we previously tested. Both reels sport similar features, but the Fuego is slightly more compact and does boast some more advancements and added refinement. In fact the reel is actually situated one notch above the Daiwa Sol spinning reel. Positioned in between the Sol and Certate the Fuego is really designed for anglers that are looking for a magnesium reel at a mid range price point. Though the Fuego contains many of the same features as it�s siblings it has a unique profile. 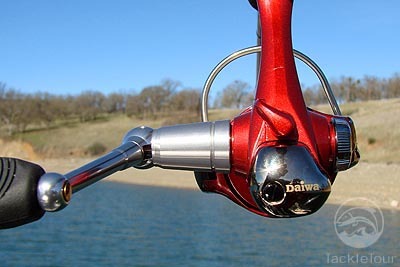 Unlike the other spinning reels in Daiwa�s premium lineup it does not feature the angled back, and instead is squared off and slightly more compact. 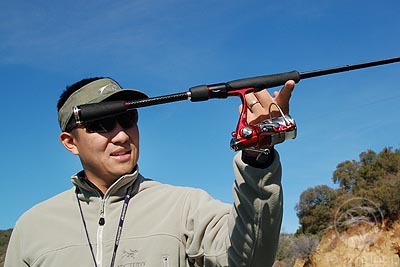 I was excited at the proposition of pairing the Fuego with the Steez Compile-X spinning rod. 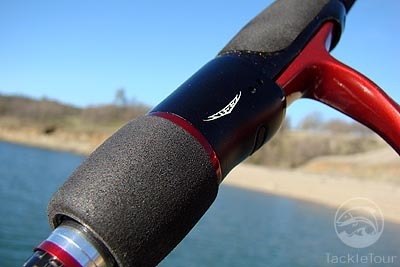 Though the Steez rod was designed for the Steez spinning reel it looked absolutely perfect with the matching red Fuego. I was amazed how well this ultralight reel balanced out the entire rig. 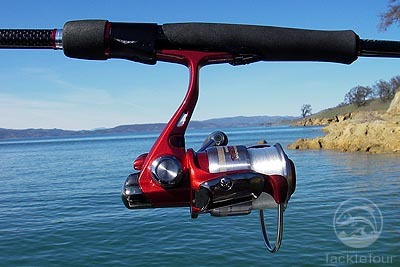 The balance point with the 2000 size Fuego was right above the reel on the grip. It felt light, sensitive, and yet powerful�.powerful enough that I decided to skip the panfish tests and go straight to some harder fighting smallmouth. Real World Test: To test the Fuego we head directly for smallmouth water, and for us that means Lake Berryessa just north of San Francisco. Lake Berryessa is a rich fishery that supports smallmouth, largemouth, spotted bass, trout, and even landlocked salmon. All of which made it the perfect site to test the capabilities of this undersized reel, as we never knew exactly what we would hook into. Next Section: Enough talk, fish already!